The El Salvadorian coffee we are buying is some of the most consistent, reliable, solid and and versatile coffees we are carrying. This is a result of many years of cooperation with producers interested in developing their products and adapt to requirements from us and our clients. The most impressive thing with coffees from our producers in El Salvador is the overall quality of picking: deep blood red and uniform color. Considering the volumes they are doing in total it is pretty amazing! There are several reasons for why we buy coffees from El Salvador. First of all it’s a range of just very good all-round coffees that everyone tends to like. Secondly they also have a great climate for coffee production and specially for drying naturals and honeys. We do a greater selection every year of different process and cultivars. And the producers we work with are constantly developing new products and are investing in innovation and quality. They are used for filters, as single origin espresso and in espresso blends. They are balanced, yet with good body and structure. Flavors ranges from fruit driven and florals, to subtle fruit and more chocolaty flavors. The most impressive thing with coffees from our producers in El Salvador is the overall quality of picking: deep blood red and uniform color. Considering the volumes they are doing in total it is pretty amazing! And there is not many places we have such a consistent quality production either. We buy the coffees directly from the farmers in two regions, Santa Ana and Usulatan. Even if we mainly buy washed coffee of the Bourbon cultivar, we also do a wide range of processes such as Honeys and naturals. Even with increased volumes of naturals and honeys, our main range of El Salvadorian coffees are mostly based on washed coffees that are just very clean and well processed. They are more stable and long lasting than most other Centrals and appears very solid, rich, sweet but still complex. We see them as all round coffees that can work as SO espressos, filters and in blends. The last few years the producers we have worked with have developed a great and very interesting range of coffees with different processes on fermented and washed coffees as well as the honeys and naturals. They also do different cultivars, pruning techniques and inputs that creates an even wider range of flavors. We are always paying premiums “directly” to the farmers and producers. The coffees are always trace able back to a specific block and cultivar at the farm level. We are always visiting the producers and the farms 2 times or more pr year. We always pre-contract coffees and volumes, most of them on three years bases. The producers have their own storage facilities and dry mill. The producers are also licensed exporters and sell the coffees directly to Nordic Approach. Coffee has been cultivated in El Salvador since the 1800 century. They claim 70% is still Bourbon heirloom varietals. 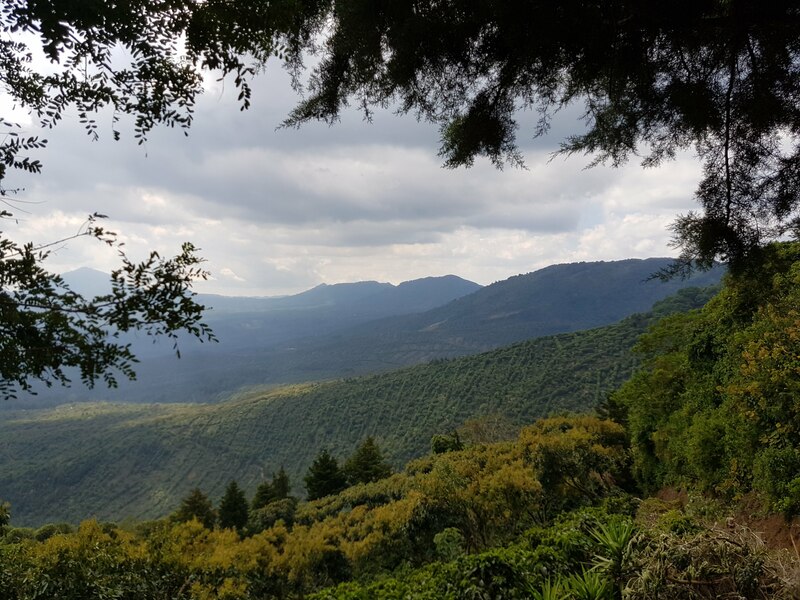 Most coffees are shade grown and the coffee areas counts for up to 75% of the forest areas. Coffee production is therefore the barrier against deforestation. The production has decreased significantly the last few years, mainly due to climate change and plant diseases. This is dramatic and creates unemployment that leads to hard crime and gang activities. There is currently about 19 thousand coffee producers in El Salvador, 85% or more is having less than 7 manzanas (4,9 hectares). Coffee is grown all over the country and is spread out in 6 mountain ranges (regions). The most known mountain ranges is Apeneca Ilamatepec and El Balsamo Quesaltepec. We are currently working in the departments Santa Ana and Sonsonate in Apaneca Ilamatepec and Usulatan in the Tecapa Chinameca mountain range. The latitudes are ranging from 13 degrees to about 15 degrees. 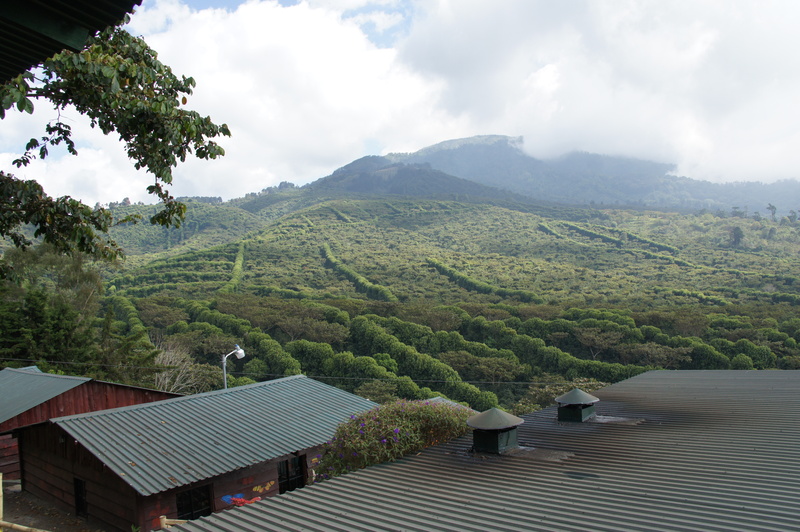 Altitudes for coffee production can vary from 1200 – 1800 meters above sea level. The way we source coffee there is based on two bigger projects. There is The Jasal group that is a family runned operation with many different farms and one wet mill, and Los Pirineos that is a farm and wet mill owned by Gilberto Baraona. We have personal relationships with the producers we work with, and are regularly visiting their farms. We have insight in how they treat their workers, and a good overview of their ethical standards. 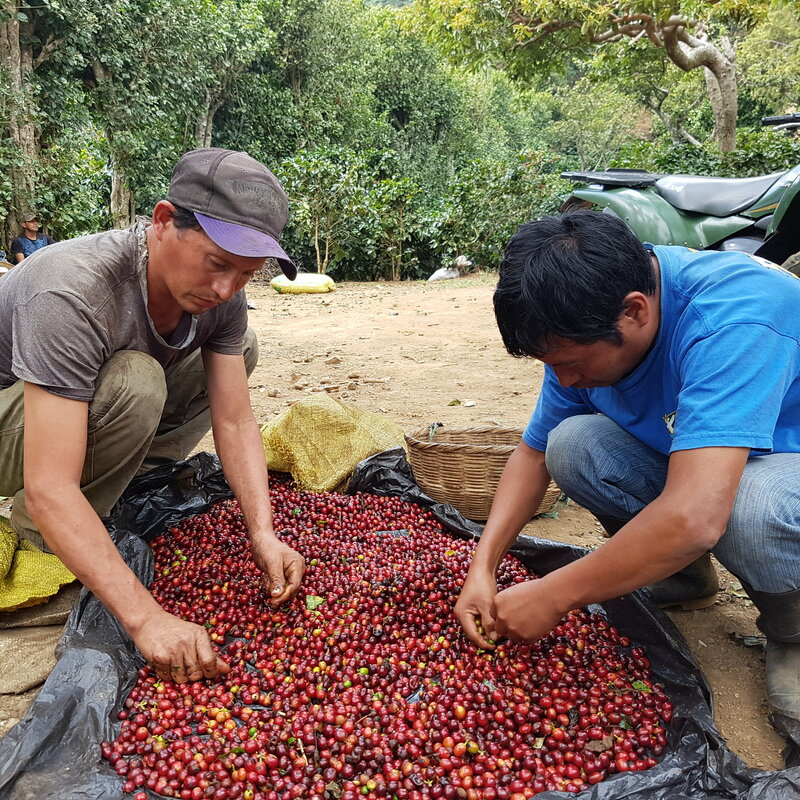 They have employees that have been there for decades, and they have realized that investing in people is also investing in the quality of the coffees. We are mainly buying special preparation coffees, and are alway paying good premiums for those. Through experience and ground work over decades we have partnered up with the producers we trust, that share our philosophy on quality and sustainability. And we try to developed the products and the market together. We have always paid good premiums for the coffees and have been all transparent about it. In return the producers have been very committed to invest in research and quality development. And we have roasters visiting them every year that are developing their own relation with these farmers, and also their own range of products. We believe sharing information both ways will contribute to better coffees and a higher price acceptance at consumer level. Eventually this can lead to a more sustainable price level for the farmers and higher salaries and better working conditions for the workers and families. We buy our coffees at fixed prices without looking at the daily coffee prices. We generally pre-contract coffees to help the producers to budget and get finance up front of the harvesting season. For Salvador, we have also done a lot of three years contracts to help the producer to plan and budget for the future crops and qualities. When we pay premiums to the growers we want to follow up and ideally see that they invest in quality and improve the conditions for their workers. In the end we see the producers as our business partners. As for any lasting business relationship everyone in the supply chain have to make their fair share. The producers and workers too. What we want is to come back year after year and buy the same or better qualities. The main cultivars used for our producers is different types of Bourbon. The well known ancient Bourbon Elite is counting for some of it, then there is a hybrid they call San Francisco that is a crossing of the old Bourbon and Pacas (a dwarf Bourbon). Other normal cultivars in our range is Catuai, Pacamara and some lots that are a mix. We do also have some experimental lots of other excotic cultivars. And more to come in the next few years. The producers we work with in El Salvador is probably having the ripest and most uniform selection of cherries among all the countries we buy from. 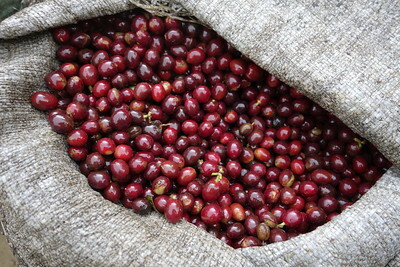 Firstly, the maturation is relatively uniform, and they let the cherries mature very well before they are picked. Secondly the workers are very well trained, and they have strict quality control on selection and hand sorting. Normally they have one opening pass, where the amount and degree of ripeness is relatively low. After this they will have two main passes for the best selection, and then a forth pass to clean and strip the trees. If the maturation is optimal and uniform they might only do three pickings pr area. In general there will be 3 weeks in between every pass to let the cherries mature properly. The producers will normally have a mix of permanent workers as well as casual workers for the harvesting season. In most cases our producers hire them locally and are trying to pay them well to get loyalty and quality in return. They will also have managers that monitors the picking and hand sorting before it goes in to production. We have three flavors of Washed Coffee in El Salvador, washed (lavado), soaked and double soaked. In El Salvador (and much of Central America), wet mills are using mechanical pulpers (Jotagallo, Ecopulper, etc). These machines start by taking off the skin and pulp. The second optional step is to mechanically remove the mucilage (sugars) by spinning it quickly. This can remove 80-90% of the mucilage from the parchment, with the rest staying on the parchment during drying. This is the standard washed ("lavado" in Spanish) process that most people are doing. When one of our lots says washed or lavado, it's this process. In other places they would call it white honey. Many of our coffees are soaked, meaning we add an additional step of soaking overnight in clean water to remove any remaining mucilage. We like this process for a variety of reasons, including a transparent cup profile and more uniform drying for improved shelf life. The newest experimental process we are trying is called double soaked. We keep all the mucilage (skip the spinning step), then we ferment the coffees under water overnight, rinse and wash it in clean water, and then we soak it again for another 10 hours. This is a similar process to what they traditionally do in Ethiopia. The whole idea is to take the same cherries and adjust the pulping/fermentation process to see how the flavors come out. So far the results have been great! We do more honey coffees from El Salvador now than before. They are mainly keeping all the mucilage on the beans (full honey) and the majority is dried on raised beds in sun. Some are dried on beds under shade and on Patio. As for honeys the majority is dried on raised beds in sun. Some are dried on beds under shade and on Patio. We are still experimenting quite a bit with the drying process, thickness of layers etc. Drying is traditionally done in concrete or clay patios. But many have also started to dry coffees on drying beds. Depending on the altitudes the temperature will vary, and so will the drying times. But this can also be compensated by how you build up the layers. Many of the central American coffees detoriates quickly and are tasting old even before 6 months after harvest. We think this got a lot to do with the drying, and if you don’t have avareness the coffee can dry in 2-4 days. We have a lot of dialogue and have done many trials to increase drying times. In most cases it can be adjusted with layers and covering the parchment mid to let it rest and to get a more homogenous drying helps on both aging and cup profile. For commodities and generic coffees many larger producers and/or exporters are also using guardiolas (mechanical dryers), but none of the coffees we are buying is mechanically dried. Nordic Approach visits Las Cruces, Santa Ana, El Salvador.